Switch your tablesaw, planer or other woodworking tools ON, and your dust collector turns ON automatically. Switch these power tools OFF and the dust collector goes OFF all by itself. 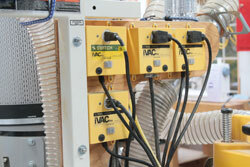 This is what the Canadian-designed iVAC Pro offers, and it’s a big benefit for those of us with woodworking shops. As far as I know, it’s the only wireless remote control dust collection system of its kind in the world, and after more than ten years of experience in my own workshop, I can say for sure that the iVAC Pro works exactly as advertised. Click here for a detailed tour of the entire dust collection system in my workshop. The system includes adjustable turn-off time settings, allowing your dust collector to run for 0, 5, 15 or 45 seconds after any one of the controlling tools is turned off. There’s also a factory-set turn-on delay of 1.5 seconds, to stagger the start-up power surges of the tool and dust collector. The system is the work of electrical engineer Graham Neathway, and I spent several hours learning about the product in my own workshop, first during the development stages, then full-time after production models came out. At this stage I really would not want to go back to manual switching. The iVAC Pro worked reliably beyond a 40 foot range in my own tests, and it can be configured to work independently of neighbouring systems in the same workshop. A hand-held remote control has recently been offered, allowing push-button ON/OFF control of dust collectors independent of machine operation. Different modules make up the system and you can find them at Lee Valley Tools Click below to watch a video tour of the iVac system I made back in 2010.